Take Willem de Kooning's remark that "FLESH was the reason oil paint was invented." He's suggesting that oil paint is more like flesh than anything else, referring to the textural quality of it and to the build-up of the many thin translucent layers in the paintings of the old masters – that the painting is not just a representation but it’s actually a manifestation of flesh. Willem de Kooning made some very fleshy paintings. Willem de Kooning, North Atlantic Light, 1977. SPAN is a good example of what I mean by enactment. Span, 2001. Encaustic on canvas, two panels, 36" x 96". 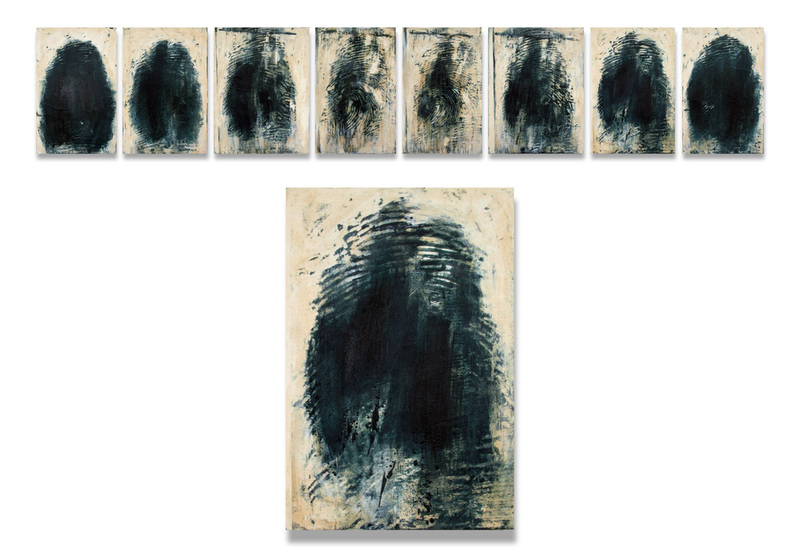 Each panel depicts a deformity: two fingers that are webbed or grown together. So each panel is a set of webbed fingers. The dark areas of the painting were there in the original source image. 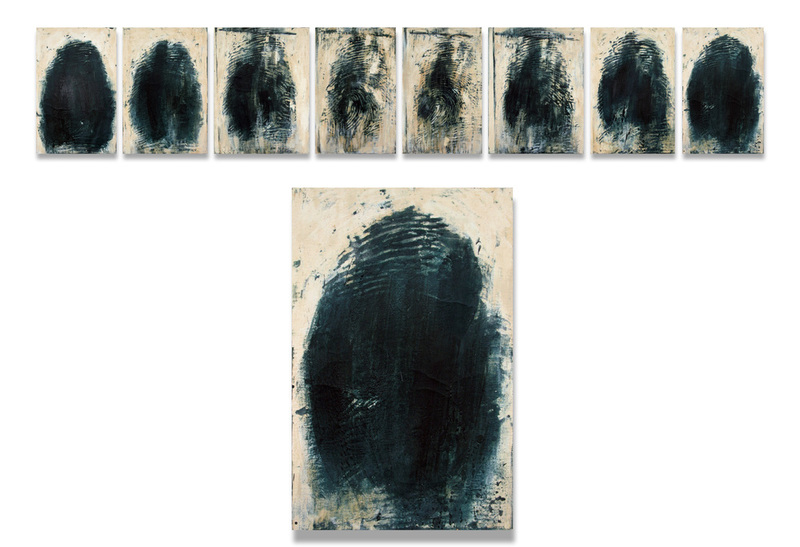 These are just spots where the ink gets clogged up in the irregularly shaped digits – but when I made it into a painting it became this aggressive gestural passage that joined or spanned the two panels of the diptych. 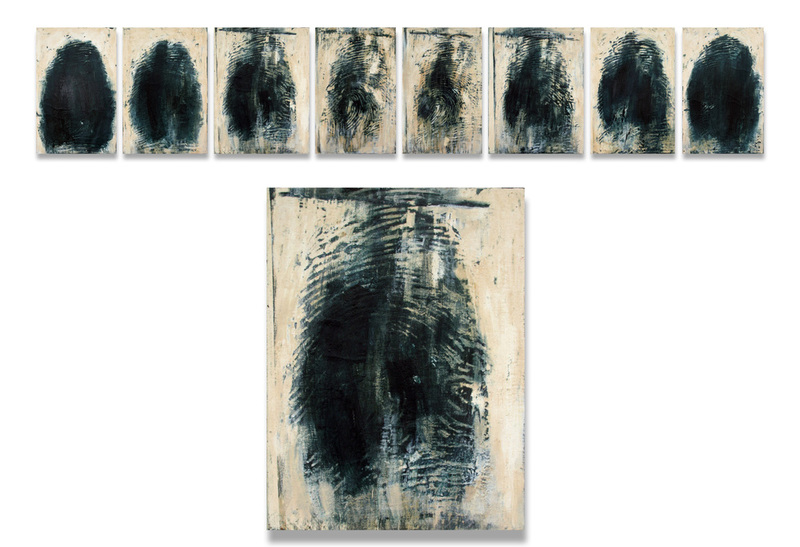 The panels are joined together, physically, by the thick gestural paint in the same way that the webbed fingers that are depicted are joined together by flesh. So the painting approaches this situation in which it becomes or IS AN ENACTMENT of what its depicting. SPAN is from a few years ago, but this next one HUMAN HEART is very recent. Human Heart, 2005. Encaustic and coffee on canvas, eight panels, 24" x 174" installed. HUMAN HEART is derived from two sources. The first image is an illustration from an FBI manual which depicts a sequence of several impressions taken from a single inked plate. So in the original image you can see the print fading as one impression after another is taken. I reversed and repeated this sequence, creating a cycle that is very close to the second image I was working with - a sequential echocardiogram depicting one cardiac cycle of the human heart, or a single heartbeat. Problems in Fingerprinting the Dead, 2002. Encaustic and coffee on canvas, three panels, 30" x 42" each panel. 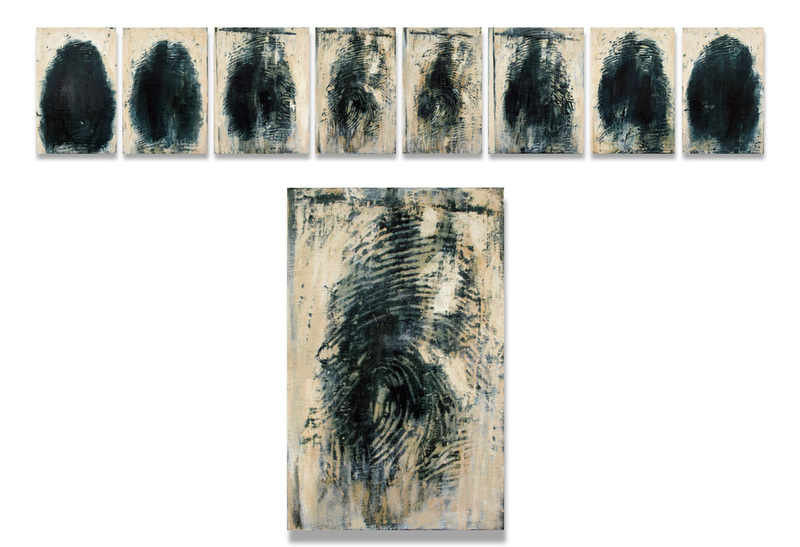 PROBLEMS IN FINGERPRINTING THE DEAD is another set of sequential paintings and it’s an earlier one. This is also based on an illustration from an FBI technical manual. It has to do with recording a fingerprint over a period of time as the print becomes obscured due to the advancing stages of de-composition. In this case it’s the working of the surface (my brushwork) that’s coming to the surface and obscuring the fingerprint. But what’s cool about this one for me is that the fingerprint is actually lifted from “The Dance to the Music of Time” by Nicolas Poussin. That’s Poussin’s fingerprint. The original is an unremarkable allegorical picture in which, remarkably, the entire surface is embedded with fingerprints, all made by the same digit, presumably the artist’s own.